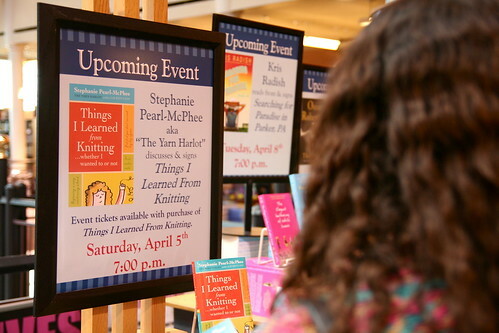 The Yarn Harlot came to Lexington, Kentucky on April 5th, so Crafty Mands, Matt and I made the trek down to Lexington to see her. I had a lot of fun, and just like last year, Stephaine was great! I’m looking forward to reading the new book. Matt was kind enough to be our "paparazzo" for the day and took some lovely photos. Me and Amanda – "OMG! Yarn Harlot!!" Notes: No notes, really. I followed the pattern and made no modifications. I love how it came out – it has great drape to it. I’m glad I didn’t try and block it because it would have lost so much if I did. I find it to be fairly light considering it’s a cotton/silk blend yarn, but it does keep me warm enough when wearing it and doesn’t feel like it’s weighing me down at all. Now I just need a shawl pin so I can wear it more! I still need to do FO reports on my mom’s Nine-to-Five socks and my Grandma’s shawl. So much life stuff has been going on that I just haven’t had time to block the shawl or take photos of anything. What am I currently working on? Well, the sock I started with the Lorna’s Laces was ripped out because the fabric was just too lose for me, so I started another sock with different yarn and US 00 needles (I was using US 0’s for the Lorna’s Laces socks). I love the fabric I’m getting with the US 00’s, so that may be my new standard for socks. I’ve decided that I will not knit any more socks I can’t wear (they hurt my feet if the fabric is too loosely knit) and if that means I have to use US 00’s or US 000’s, then I’ll do it. It’s worth the better end result. 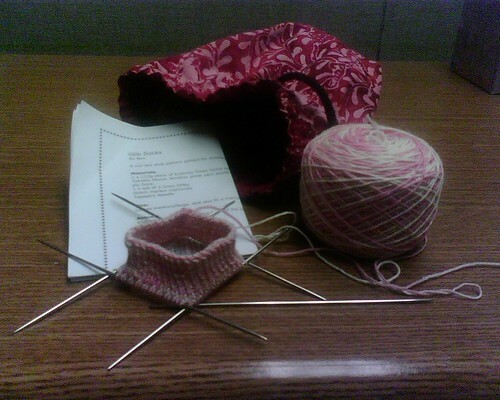 So, I have those socks on the needles and I’ve been working on the Lady Eleanor stole. Mostly been working on the socks, though. Socks seem to be my favorite project these days, though I’m sure that has something to do with the fact that I only seem to be knitting on-the-go lately and socks are a great portable project. I’ll post photos of my new sock (already turned the heel and almost to the toe – started them last Friday) and an in-progress photo of where I am with the Lady Eleanor stole soon. Lately I’ve seen a number of bloggers (knit-bloggers especially, since those are the blogs I follow most) that have decided to stop blogging or blog very, very little these days and various websites that have "close up shop." I’m saddened by the number of people doing this because the blogs and websites I follow or check often are carefully chosen, but I do fully understand that people have lives to live outside of blogging and websites that they run in their spare time. After all, according to the New York Times, blogging can kill you. I think it’s a little funny that I read that article the other day and since then I’ve seen a number of bloggers post that they aren’t going to blog anymore (all for various reasons, mostly personal), then noticed that a lot of blogs I was reading haven’t updated in quite some time, and today I find out about MagKnits. I think I find it all rather interesting since I’ve been blogging since I was 17 or so and have found myself at an undecided place with it. 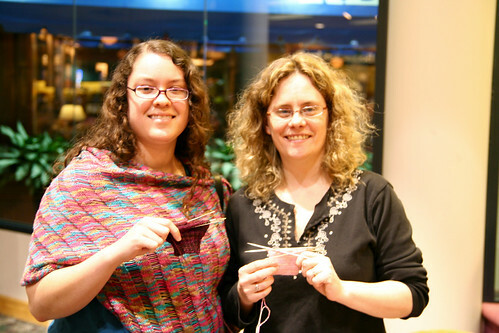 I also think it’s sad to see these blogers no longer blog since I have enjoyed reading their posts/websites for quite a while now and to see MagKnits take down their website (they had some great patterns!). Shawl progress, new socks, and seeing the Yarn Harlot! I’m getting close to being done with the shawl. I have maybe 8 to 10 more rows before I bind off, but these rows are looooooonnnng. I don’t eve know how many stitches, but it takes me 30 mins to do MAYBE 3 rows. It’s crazy. I have to concentrate on it every other row so I don’t mess up the lace pattern, so it’s not really a great "mindless knitting" project nor is it a good portable project. I mean, just look at how big it’s become! 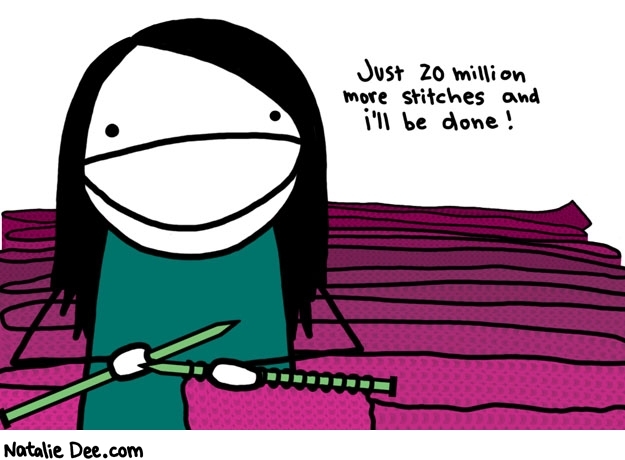 I don’t have any great portable projects on the needles right now. I take that back. I do have one project that might qualify as portable, but it’s a scarf and being that it’s spring and moving into summer, it doesn’t feel right to me to be knitting a scarf. 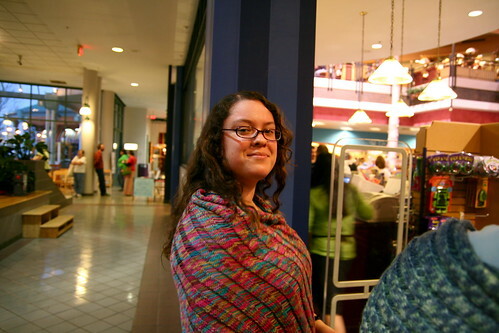 Maybe if it was a lacy scarf it’d be alright, but it’s not. I can’t seem to get myself to knit warm weather gear in the spring and summer months! Anyhow, I generally always have a pair of socks on the needles as my go-to portable project, but I put myself on a cast-on ban while I was working on the shawl in hopes I would get it done really quickly by not working on anything else. That’s not working out so great, though, because of the long rows I have now. 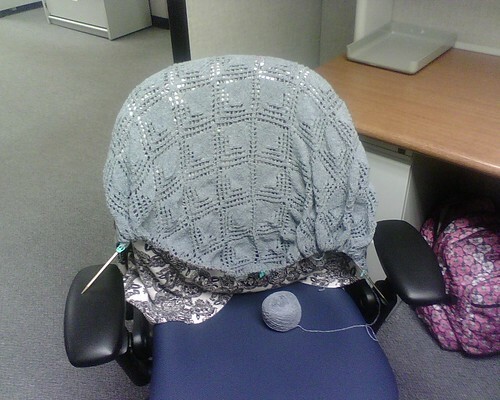 I haven’t had time to sit and really work on it, only get a row (or a few stitches!) done here or there. The other projects I have on the needles aren’t portable at all and require quite a bit of attention that I haven’t been able to give recently. Since tomorrow we are going to go see the Yarn Harlot in Lexington, I thought it’d be good to have a fairly mindless portable project to take with me. Socks! So, yesterday I cast on a pair of socks out of the Lorna’s Laces that Crafty Mands gave me. The color is pretty accurate in the photo despite the not-great cell phone photo. I’m using the Glib Sock pattern (sorry it’s a Ravelry link – it’s only available through a Ravelry download!). I did add an extra stitch repeat, which was a little tricky to do, but I’m glad I decided to add more stitches because I think it would have been a little too tight otherwise. Maybe eventually if it stops being crappy out with all the rain we’ve been getting here, I can actually take some decent Clapotis photos and actually post about it! Still waiting to get a photo of the socks I finished for my mom, but I think sun would do them the most justice in a photo, so that’s on the eventually list for now, too.